The embedded CTI (Computer Telephony Integration) Connector provides call and agent state controls within the Siebel Communication Toolbar, eliminating the need for agents to switch between applications. This third-party CTI link happens at the server level between Siebel Communications Server and Finesse Server, so no component needs to be installed/ configured on the agent's side. Any information in UCCE such as ANI, DNIS, and ECC variables can be used to pop up a customer profile. 1. Screen pop with incoming call. 2. Show multiple customers mapping a callerID or variable set from ICM. 3. Show customer details information if callerID or variable. As an alternative, Siebel can be emebeded in Cisco Finesse as a gadget. Handle Cisco UCCX non-voice channels (chat, email etc.) from within the CRM interface via CTI Toolbar by leverage on Expertflow's Chat Engine or the CCX Mediarouting Engine. * blind transfer in case of CCX only supported in 11.6 or higher. Siebel Communications Server (SCS) needs to be pre-installed by your Siebel consultant. This requires for up to 50 agents 2 cores, 4GB RAM and 10GB HDD. for up to 400 agents 4 cores, 4GB RAM and 20GB HDD. We currently only support SCS on Windows Server 2012 R2 64-Bit or above. If your main Siebel installation is on Unix, you can still run SCS on Windows. Technical Design Guide for the Expertflow connector . The connector interacts with Cisco Contact Center on one side and Siebel Communication Server on the other side, essentially translating state changes between the two solutions. In addition, it stores temporary information used during call transfers from one agent to the other. On Siebel side, native Siebel Communication Server functionality is used. 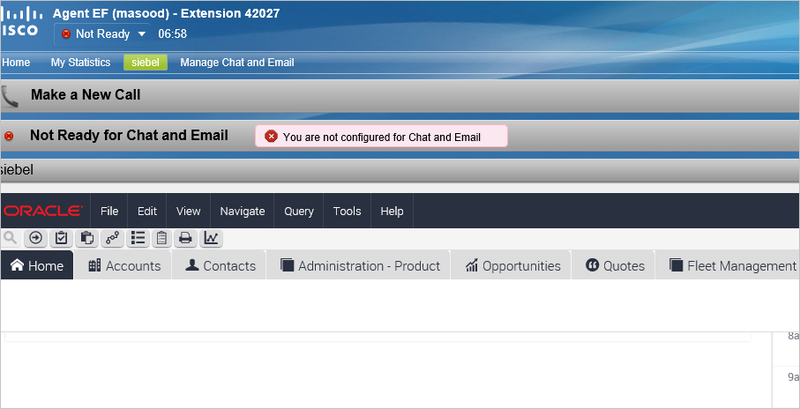 Siebel Communication Server enables a native toolbar in Siebel within the Agent's Siebel Web client.